Why particle detectors need a trigger?? Nature sometimes demands a lot of effort in order to reveal its secrets. Particle physics, of course, obeys a very similar pattern. Many, many events have to be analyzed in order to find a few that can be really interesting. Let’s take the case of the ever sought Higgs particle. The probability of generating a single Higgs is quite small. Assuming that in the total period from the start of the physics operation in 2010 and ending just before the July 4th, 2012 announcement comprises, in fact, around 450 real LHC operation days, we had, on average, 480 Higgs per day (all numbers in this post are approximative). However, quite unfortunately, most (~60%) of these Higgs decay in a mode (H->bb) which is very easy to confuse with other production modes or (~20%, H->WW) in a mode not so easy to measure precisely its properties. One of the cleanest modes to study the Higgs is its decay into two photons. The photons were detected with the ATLAS calorimeters (see our previous posts). But the quantity of produced events in this mode is much smaller (basically, around 1 per day!). Sometimes, LHC produces more than 30 million collisions per second. Now, imagine that the LHC could only produce a tenth of this number of collisions (3 million), we would have to wait 10 days for a detectable Higgs. Here comes (at last!) our central topic. Given the rarity of Higgs events, the LHC has to produce a ridiculously high amount of events per second to produce a few interesting ones in a practical rate. Given also the fact that Nature loves to produce other events which are very common and very well known, our detectors are filled up with events that are basically junk (background), at least for Higgs search. If we recorded all of the events produced in ATLAS, more than 40 GBs of data storage space would be necessary per second. That would be simply unmanageable!!! So, the only way to have a reasonable data flow and still be able to make physics at a reasonable rate is to select events before recording. That’s what we call the “trigger”. Immediately two obsessions related to the trigger system appear : reduce as much as possible the huge rates of events faking good signatures (or the data acquisition system of the detector will not handle the stress); highest possible efficiency : never loose a very good candidate of a given signature or you loose the physics event which is exactly why one builds such gigantic machines!! In the case of a lost Higgs, another working day will be necessary! As you will later on the next posts, the algorithms used in the trigger operate always at the limit rate in which they can guarantee a very high efficiency (usually, not too far from 100%). The picture above (stolen from many places in the web – see the caption), is not very far from the truth. 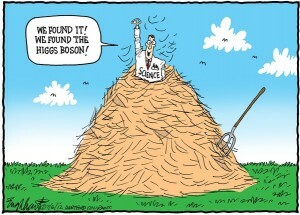 To find a Higgs, you have to search a lot. 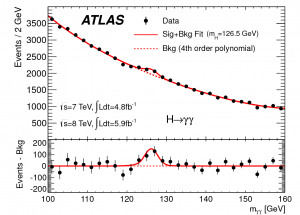 See for instance, the official ATLAS plot for the Higgs detection. In this plot, the amount of Higgs candidates shown as an excess is quite small (around 230-250 events in the 4 bins between 122 and 130 GeV). See in the top plot, that this excess shows up in more than 8000 events (around 2000 in each of the four histogram bins). And this after trigger and offline analysis selection, for a very narrow mass range and only for events in which two photons were detected! In principle, we should expect more Higgs (around 400-450), but some are lost because their photons appear too close to the particle beam and ATLAS does not see them (or at least misses one of them and the pair cannot be formed). Others are lost because the requirements to accept a photon as such are very restrictive and the chance of loosing at least one of the two photons is relatively high. So, loosing a fraction of these events is unfortunate, but unavoidable given the experimental conditions. Another remarkable fact is that we cannot necessarily know which 250 events of those 8250 are really related to Higgs. We just know that the Higgs contributed by increasing the rate of possible events in that mass range. The researchers are always trying to find some clever techniques to avoid the 8000 unnecessary events, but this is no trivial task. If a new technique is developed, it would certainly end up included as a trigger algorithm. As for the “videos” section of this post, I’d like to make a little propaganda about some sources of information. So, I recorded quick working sessions on two tools that are used in the ATLAS Control Room to visualize a small fraction of the acquired events while the experiment is running. The first is directly from the atlas.ch web site, the so called atlas live events (check the link!). It takes around 15 to 20 seconds to change the event. I made a short extract in the video below. Another very nice tool is Camelia that can make 3D images from events coming directly from the ATLAS detector and you can play with them. The important point here is that most of the events displayed (a random sample) are the ones which have very small signal (lots of tracks with low momentum) but almost no important signal (straight lines with some calorimeter activity). If you wait long enough you will eventually see some interesting events. This demonstrates why we need to apply a strong selection to avoid wasting recording time and space with trivial events. You may want to see these in full screen. I advise also the third video, where I tried to make a quick analysis using a pre-recorded events. First, one finds two jets in a single event (it could be two photons) and later two muons. Summing the muons momenta, we can see that the pair mass (93 GeV/c2) is quite close to a Z boson mass (91 GeV/c2). In the next post, we will see the three levels of the ATLAS trigger system with increasing complexity and accessing each time more details of the detector. When it gets to the software trigger levels, we will probably have a post about computing in such environment (yes, the trigger software must be fast, even if you have to loose a bit of precision!). If you are interested in understanding how one of these detectors work, I advise a look at my latest 3 posts (first, second and third). You will need that information to understand the trigger. Por vezes, a Natureza exige um grande esforço antes de revelar seus segredos. A física de partículas obedece um padrão similar. Muitos, muitos eventos têm de ser analisados antes de se encontrar alguns que sejam realmente interessantes. Vejamos o caso da famosa partícula de Higgs. A probabilidade de gerar um Higgs é bem pequena. Assumindo que o período total de operação do LHC real em torno de 450 dias em 2010, 2011 e parte de 2012, tivemos, na média, cerca de 480 Higgs por dia (os números discutidos são aproximações). Entretanto, infelizmente, cerca de 60% desses Higgs têm um modo de decaimento (H->bb) que é muito similar à outros processos físicos, e, logo, difícil de detectar. Outro modo de decaimento (H->WW, 20%) é um pouco difícil de ter suas propriedades medidas. Um dos modos mais “limpos” de se detectar o Higgs é o seu decaimento em dois fótons. Estes fótons sensibilizaram os calorímetros do ATLAS (veja posts anteriores). Mas a quantidade de eventos produzidos dessa forma é muito menor (mais ou menos uma vez por dia!). Algumas vezes, o LHC produz mais de 30 milhões de colisões por segundo. Agora, imagine que o LHC produzisse um décimo desde número (3 milhões), teríamos que esperar 10 dias para encontrar um Higgs detectável. Assim, chegamos (finalmente!) no nosso tópico central. Dada a raridade com que eventos possuindo Higgs acontecem, o LHC tem que produzir uma quantidade ridiculamente gigante de eventos por segundo para produzir alguns interessantes numa taxa praticável. Também dado o fato de que a Natureza adora produzir eventos que são já muito conhecidos, nossos detectores são mantidos cheios de eventos inúteis, pelo menos inúteis para a procura do Higgs. Se gravássemos todos os eventos produzidos no ATLAS, seriam necessários mais de 40 GB de espaço de armazenagem de dados por segundo! O manuseio de tantos dados seria impraticável. Ou seja, a única forma de se ter um regime de armazenamento mais razoável e ainda ser capaz de fazer os estudos da física é selecionar os eventos antes de gravá-los. Esse processo é chamado de “trigger” (cuja tradução literal seria disparo). Imediatamente, vemos dois tópicos que são verdadeiras obsessões no domínio do trigger : redução ao máximo das gigantescas taxas de eventos fingindo ser boas assinaturas (para reduzir o stress sobre o sistema de aquisição de dados); maior eficiência possível : nunca perder um evento interessante que é exatamente o motivo pelo qual construímos essas máquinas gigantescas! No caso do Higgs, isso pode ser traduzir na necessidade de esperar por todo um novo dia de trabalho! Como ficará claro nos próximos posts, os algoritmos usados no trigger operam sempre na taxa em que eles ainda possam garantir altíssima eficiência (usualmente, próximo a 100%). Veja a figura acima (encontrada na web – veja o link no texto da figura). A brincadeira é muito próxima da realidade. Para encontrar um Higgs, deve haver uma extensiva procura. Veja por exemplo, a figura da detecção do Higgs pelo detector ATLAS. Nessa figura, a quantidade de candidatos à Higgs aparece como um pequeno excesso (cerca de 230-250 eventos nos quatro bins entre 122 e 130 GeV). Veja na parte superior da figura que esse excesso acontece sobre cerca de 8000 eventos (distribuídos em quatro bins do histograma). E isso, depois da seleção do trigger e da análise offline, por uma pequena faixa de massa e para os eventos nos quais dois fótons foram encontrados. Em princípio, deveríamos ter mais Higgs (cerca de 400-450), mas muitos são perdidos porque seus fótons aparecem muito perto do feixe de partículas e ATLAS não os vê (ou não vê um deles, logo o par não pode ser estudado). Outros são perdidos porque os requisitos para aceitar um fóton são muitos restritivos e a chance de se perder um deles é relativamente alta. Assim, perder uma fração destes eventos é muito ruim, mas inevitável dadas as condições experimentais. Outro fato remarcável é que não podemos saber quais 250 dos 8250 eventos são realmente relativos ao Higgs. Apenas sabemos que o Higgs contribui para o aumento da taxa de eventos naquela faixa de massa. O pesquisadores tentam inventar novas técnicas inteligentes que permitam evitar os 8000 eventos desnecessários, mas essa não é uma tarefa simples. Se uma nova técnica for desenvolvida, ela vai acabar sendo aplicada no trigger. Para a seção de vídeos deste post, eu gostaria de aproveitar para fazer uma pequena propaganda de algumas fontes de informações. Assim, gravei uma rápida seção de trabalho em duas ferramentas que são utilizadas na sala de Controle do ATLAS para visualizar uma pequena fração dos eventos adquiridos enquanto o experimento está tomando dados. O primeiro está disponível no site atlas.ch com o nome de live events (eventos ao vivo – visite o link!). Demora cerca de 15 a 20 segundos para se trocar o evento. Outra ferramenta é a Camelia que pode fazer imagens 3D dos eventos vindos diretamente do detector ATLAS, e você pode brincar com o detector. O ponto importante aqui é observar que uma amostra aleatória é basicamente composta com eventos com pouco sinal (muitos traços com pouco momento) mas quase nenhuma atividade no calorímetro. Se você esperar algum tempo, você verá alguns eventos com um nível de atividade razoável. Isso demonstra o quanto precisamos fazer uma seleção forte para evitar desperdício de tempo e espaço de dados com eventos triviais. Talvez seja mais prático ver estes eventos em tela cheia. Também tentei fazer uma análise rápida de alguns eventos pré-gravados no terceiro vídeo. No primeiro, vemos dois jatos num mesmo evento (podem ser dois fótons não corretamente identificados) e, depois, vemos dois múons. Somando o momentum desses múons, podemos ver que a massa do par (93 GeV/c2) é muito próxima à do bóson Z (91 GeV/c2). No próximo post, veremos os três níveis de trigger do ATLAS acessando a cada nível mais detalhes do detector. Quando chegamos no nível de seleção do trigger por software, provavelmente teremos um post sobre computação neste ambiente (o algoritmo tem que tomar decisões rápidas mesmo que seja a perder um pouco de precisão!). Se você está interessado em como funcionam os detectores, revise meu últimos três posts (primeiro, segundo e terceiro). Você vai precisar disso para entender o trigger.